We all know those classic Popscile that is shaped like a rocket. And now this Rocket Pop is going to space or at least on this t-shirt. This dark grey shirt shows stars and in the middle the Rocket Pop with it’s wooden stick on fire. A shirt like this is fun because it shows space travel and desert on one amazing t-shirt. You can get this t-shirt in men and women’s version and in sizes ranging from Small – 3XL. It is always time for ice cream and that may lead to people drooling when they see this special Popsicle t-shirt. 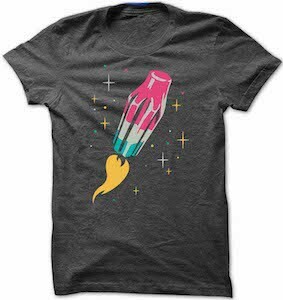 Don’t wait any longer come check out this Rocket Pop Ice Cream To Space T-Shirt.